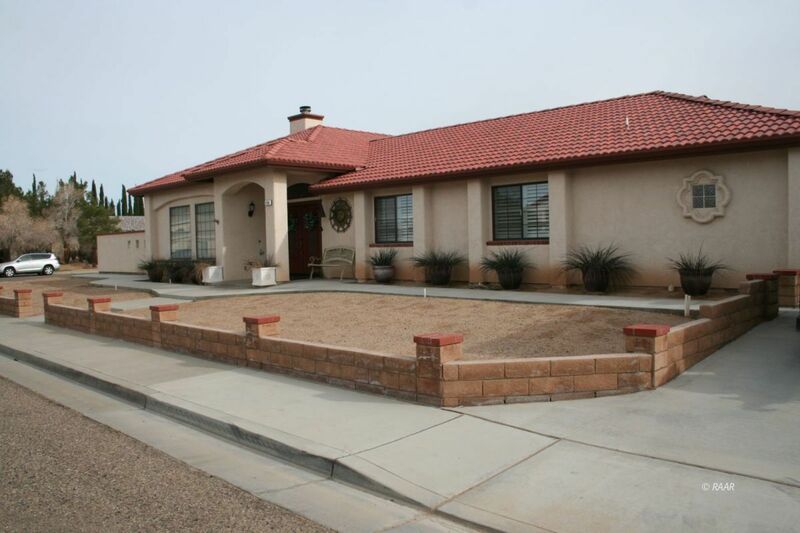 Designed to take advantage of the xeriscaped corner lot, this 2500 sqft single story home is easy to enjoy! Double door tiled entry leads to the living room on the left. Granite tiled fireplace has a large firebox and oak mantle. Large windows bring in natural light. Ahead from the entry is the family room/dining room combination. Eastern glass doors bring the covered courtyard inside on the dining room side. The family room slider leads to a smaller covered patio on the south side. The island kitchen features three door pantry, newer microwave/oven, Bosch dishwasher, tons of cabinets and breakfast nook. Spacious laundry room has ample cabinets with granite counter top, a half bath with granite counter top and access to courtyard and back yard. The secondary bedrooms are larger than most. The hall bath has two lavatories, adequate storage and tub/shower combination. The enormous master suite has two walk-in closets and French door entry to side yard. Master bath includes jetted tub, separate shower, two recessed lavatories in wide vanity and shielded toilet area. Expanded two car garage is finished and boasts another half bath. Zoned cooling. Gated RV access. Block wall. If you have any questions or would like to preview any of these properties, please call me at (760) 446-5959 or click below to email me.